If you are interested in this clocks and want to order or have a question, then fill in the Form below and Lepper will certainly get back to you with an answer to your request or order. Exclusive clock in walnut veneer and burl wood veneer. • Beveled glass and polished brass numerals. 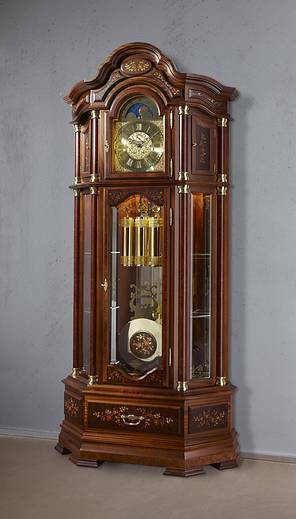 • Within the clock the back has mirrors and 6 glass shelves. • With secret compartment inside the clock. • The bottom of the clock has a drawer. • Glass side doors provide easy access and allow a view to the movement. This is an Exclusive clock with Black Forest Kieninger cable-driven movement. • With quarter-hour silence. Similarly, auto night time silence. • Pendulum and weights come in polished brass. The clock is also available in cherry or oak.